With Malaysia’s diverse culture and landscape, the possibility for adventure is endless. Visitors can climb the highest peak in South East Asia, explore exotic island retreats, make friends with an orangutan, or revel in the melting pot of culinary delights on offer. Situated on Australia’s back door step, Malaysia is the ideal destination for those looking to tick a multitude of experiences off their bucket lists, here is a number of suggestions to get started. Kota Kinabalu on the Malaysian island of Borneo is home to the tallest peak in South East Asia, Mount Kinabalu. While often assumed an impossible task for the everyday traveller, climbing a mountain is made possible by Mt Kinabalu – it is one of the easiest peaks in the world to conquer and does not demand previous climbing experience, though it does take around two days to ascend and descend. Not only that, the sunrise to be seen from the summit is nothing short of incredible. Sepilok is home to the orangutans. 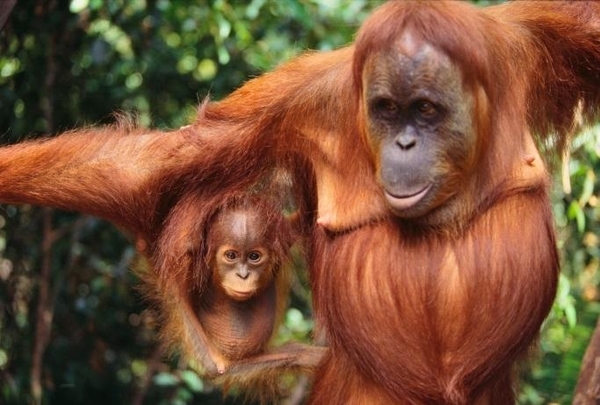 These beautiful creatures are native to Malaysia and make their home in the orangutan rehabilitation centre in Sabah. The centre occupies around 43sqkm of protected land at the edge of Kabili Sepilok Forest Reserve and was turned into a rehabilitation site for the apes. Currently it is home to around 25 young orphaned orangutans housed in the nurseries, in addition to those free in the reserve. At Lankayan, a tiny island in the Sulu Sea, elegant white sandy beaches are met with peace and calm and it’s the perfect place to unwind. Around one and a half hours north of Sandakan by boat it is the preferred turtle spotting destination with its own turtle hatchery. The Green Turtle and Hawksbill Turtle make regular appearances as the new hatchlings of baby turtles are released to the sea from June to September. Many adventurous travellers head to Sabah to get their fix of wildlife large and small. The majestic Kinabatangan River plays host to pygmy elephants, proboscis monkeys, orangutans, sumatran rhinos and clouded leopards, along with countless rare birds such as the hornbill and the Oriental Darter. Crocs can also be spotted lazing along the riverbank. Where else can you drop into crystal clear waters to be surrounded by hundreds of Hammerhead sharks? Situated 300km off the north coast of Borneo, a short plane ride away, is Layang Layang, a resort island surrounded by clear waters (visibility is up to 40m!) and pristine reefs. The island is an atoll of 13 linked coral reefs which drop down into sheer walls enabling divers the interaction with local Hammerhead sharks. Also frequently spotted are the likes of turtles, giant clams, tuna, redtoothed triggerfish, pyramid butterflyfish and unicornfish. It’s not often you can claim having indulged in a cocktail at such dizzying heights, but Malaysia has you covered. ‘Marini’s on 57’ is the country’s highest rooftop bar, offering 360 degree panoramic views of KL’s city skyline. The award-winning ‘Skybar’ is also in KL and is located on level 33 of the Traders Hotel, overlooking the KLCC Park and the Petronas Twin Towers, where you can find delicious cocktails and food coupled with intoxicating views of the city. For all the rev-heads out there, the Malaysian Grand Prix takes place each year at the Sepang International Circuit just outside Kuala Lumpur. Visitors can get their adrenaline pumping watching the exhilarating action at one of the most impressive tracks in the world, with its extreme hot and wet conditions proving a challenge for even the most experienced drivers in the world. The added bonus of it being one of the cheapest races on the circuit doesn’t hurt either, ensuring it’s an affordable option in terms of ticket prices. Located in Langkawi is the incredible ‘Sky Bridge’, offering visitors the chance to walk above the rainforest. The suspension bridge is perched in the mountains at around 100 metres above the ground. At 125 metres in length, visitors are treated to spectacular views throughout the entire walk. The mystical Muliau Basin in Sabah is one of Malaysia’s finest remaining wilderness spots. Bound by a formidable escarpment reaching over 1,675 metres above sea level, the Basin encompasses over 390sqkm of forest. The remote site is perfect for jungle trekking and bird watching, while the highlight for visitors is no doubt trekking the seven-tier Maliau Falls. Located on the Titiwangsa Range some 1,500m above sea level, the Cameron Highlands is home to a vast plantation of produce, including tea, flowers, vegetable and strawberries. Visitors can relax amongst the flourishing tea plantation with a picturesque view across the rolling hills while enjoying all the trimmings of a high tea. The Rafflesia can be found thriving in altitudes of between 500 and 700 metres in the forests of Borneo. This particular breed of foliage features small brownish scale-like leaves and fleshy foul-smelling flowers varying in size between a few inches to a metre in diameter. Buds take up to 10 months to develop and blossom for just a few days! The Ritz-Carlton in Bukit Bintang, Kuala Lumpur offers guests a seriously luxe experience, just ask Barack Obama! That’s right, the United States’ President recently called the hotel home for a weekend. The hotel is equipped with two spacious presidential suites, a private rooftop swimming pool and an elegant old English décor that is sure to please guests.